The Benjamin Franklin Hotel was opened as one of America's grandest hotels in 1923 on the site of another hotel that once stood in its place. Sadly the most memorable and famous moment at this hotel has to do with the hotel refusing to put up the Brooklyn Dodgers in 1947 when Jackie Robinson started with the team. During the city's famed Army-Navy game, the hotel was the accommodations for the army. Now this building is known as the Ben Franklin House and houses 412 apartments, 120,000 square feet of office space, and one of Philly's largest ballrooms. 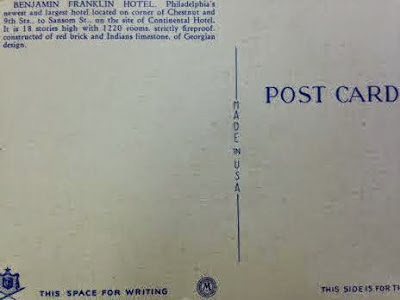 "BENJAMIN FRANKLIN HOTEL. Philadelphia's newest and largest hotel located on corner of Chestnut and 9th sts to Samsom St. On the site of Continental Hotel. It is 18 stories high with 1220 rooms, strictly fireproof. Constructed of red brick and Indians limestone, of Georgian design."